Join Lou Bugenig and Doug Waldo discuss what it takes to wrangle the stock. 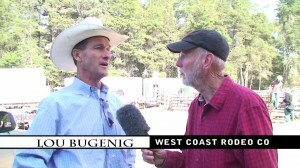 Lou Bugenig talks proudly about the relationship a modern rodeo has with it’s stock and the competitors. When one of his bulls throws a rider or a bronco bucks good enough to give the rider a high score they’re doing their job. Lou refers to his extended family of livestock with pride. “The broncos and bulls are as competitive as the riders are,” says Lou. I’ve done my job when my bulls give a rider a high score by bucking as hard as the can. They made the team! !